So, the back pain has returned... with a vengeance. eh. The first thing I do in the morning is make my bed, and that's also when that muscle in my back, announces itself. So the grumpiness started pretty early. Retail Therapy? Yeah. Fortunately at the day job I am surrounded by art supplies! Last weekend, I was writing my monthly exchange postcards with my sky blue Multiliner SP. And I was wondering why blue? Why don't I have a green Multiliner?? Or a purple one? Sky blue is great and all... but I must have variety! 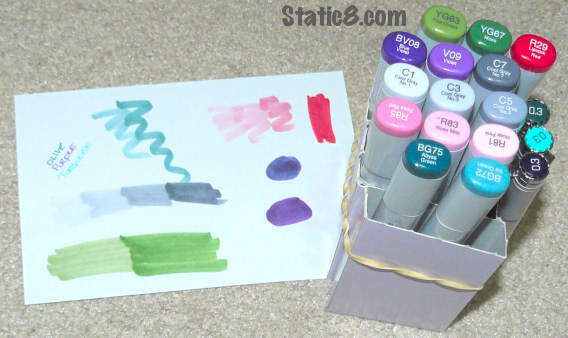 Today, my Copic order started with olive, purple and turquoise Multiliner SPs. But I figured, if I'm buying things at work, I should probably get some markers too. And the gathering began. I thought I was aiming for five or six markers. When I had 14 markers, "Somebody Please Stop Me!" I handed in my order. I've decided that the YG67 is my favorite shade of green. It's the medium green at the bottom of the index card. It's called "Moss". The Multiliners are on the side there, with the 0.3 printed on the top of the cap. My old favorite pen -- Uniball Vision Exact... now called Uniball Vision Needle -- I love this pen. It costs about 2$ and with liquid ink there are no refills. The needle point and that vivid dark black ink; those things make me happy. The Multiliner SPs are going to be my new favorite pen. It costs 9$, and the refills cost $2.50. The SP pen is needle-like, but the tip is a plastic nib rather than the ball point that Uniball has. It has a different feel to it, that's for sure. But the nib is replaceable as well in the SP, so I feel free to write as intensely as I usually do and pound on it all I want!